Hellsing took a lot of flack from people accusing it of unraveling by the time that the final anime episode rolled around. As some of you may know, the TV show was produced before the manga was completed, so eventually things began to move out of alignment from each other between the two. I personally enjoyed the show. But I like the book better already. The Hellsing organization is a family-led group that protects the crown of England against supernatural threats. Led by the stalwart Sir Integral Hellsing, the group's greatest weapon against the children of the night is Alucard, a vampire of tremdous power. While the explaination of why he works for Hellsing has yet to be revealed, his dedication is undoubtable. THe book follows the pace of the anime pretty closely, though the order of some revelations differ between the two. Unlike the clean, digital look of the anime, the book is sketchier, grittier, and darker. Characters have a little bit of insanity in their eyes, a sparkle that makes you wonder which side is really the good guys and which is the bad. In the end, you'll realize that good or bad, Alucard's too cool not to like. The book reads from right to left and keeps the original sound effects. 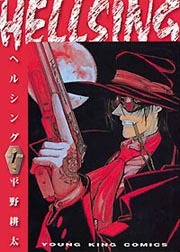 There's an extra short story in the back showing a piece Hirano wrote and drew prior to Hellsing that was most likely the springboard for the vampire series. Altogether, this is a nice release, though I personally found the Irish accent of one of the characters (Alexander, the Paladin) to be quite hard to read. Sometimes, I don't like reading dialects. This was one of them. Overall, however, this book has everything an action fan needs. Humor, impressive battles, and a good underlying sense of intrigue - it's all here. Unlike the anime series, you won't have to worry about it ending at an awkward moment. Grab this book while you can - it sells fast.